1:21.9, in the same car on the same track, obviously different days perhaps different tires but damn impressive. Rossi has been testing an F2008 at the Circuit the Catalunya in Montmeló. for the past couple of days. Massa, who's contract is up after this season will test the same car tomorrow... Interesting. Rossi's on slicks. I'm sure kimi wasn't. Not impressed considering. Somewhere else found 1.25.2, which is .3 slower than worst quali. time from last year. 1.25.2 was on wednesday, after a day of mostly wet weather and little track time. He posted a better time on Thursday in better conditions, although most reports don't state the time. The time was reported on this evenings RAI newscast. I'm not sure what spec the tires were. If they run similar tires, comparing massa's times will be interesting. But they might avoid direct comparisons, in any case I have no doubt the engineer know precisely what the equasion to correct for different tires is. You're comparing a 2008 car with slicks to a 2008 car with grooved tires. Add a couple of seconds onto Rossi's time and theres a better comparison. Also you have to remember that this car is from the end of 2008, so it got a good 6 months more development on it from when Kimi put down his qual lap, which Im guessing is probably 1 second alone quicker there from the improved down force and efficiency. But anyway, the real comparison will be to see what Massa is able to do tomorrow when he gets to drive the car which he will also hopefully get to do some low fuel runs, but even if he doesn't the engineers will know his fuel corrected times to compare with. But still, a good test time seeings how its only his 3rd or so time in a F1 car. So, Rossi's best lap was 1'21"9, Kimi's 2008 qualy lap was 1'21"813. And you want to compare those? Come on guys, do you remember the difference between slick and grooved tyres when GP2 made the change? It was 4 seconds! So, to be generous let's add only 3" to Rossi's laptime. Then there is the temperature. The air now is much more cold than in May, so the engine can spit out some more power. On a track like Barcelona with that long straight it could be worth 7 tenths. Yes, you have a bit less grip due to the asphalt temperature, but at that level of downforce, it doesn't make a big difference. Anyway, be generous again and add only 4 tenths. Now we are at +3"4. Then, look at the fuel load. Kimi's Laptime was done in Q3, with the fuel for the first race stint. Valentino was in low fuel configuration, like in Q2. 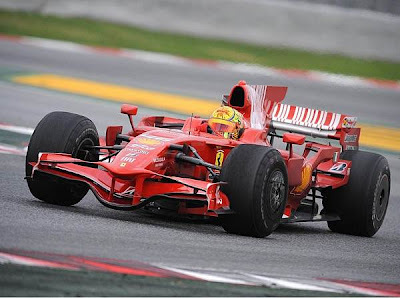 In 2008, Ferrari's best time in Q2 was Massa with 1'20"584. So, around 1"3 difference. Let's be generous, and add only 1" to Valentino's laptime. And here comes reality: Rossi was at least 4.4 seconds off the pace. So I guess you are expecting Massa to turn times in the low 1:17s today? Massa lapped in 1'20"584 with grooved tyres, so yes, I think that a 1'17", low or high doesn't matter so much, is possible with the same car equipped with slicks. I hope that Felipe will run some low fuel stints, and that times will be released, but I fear that Ferrari will not allow a direct comparaison. Let's see. You are surely right, but the difference should be great anyway, because with the slick you nearly double the contact area with the asphalt. Besides that, one of the bigger issues with the grooved tyres was their "strange" behaviour while cornering, caused by the flexibility of the protruded part of the tyre. With slicks, that problem is solved, so the drivers feel that they can really push harder. damn. I mean motorcycles are AN entirely different animal.... not AND entirely. As I feared, no official timing for Massa. And I don't think that the reason is protecting Felipe.